From the outside this Shiplap storage shed has an incredibly robust look. With a tall, gentle sloping apex roof, it benefits from a chic, traditional style that will look good in any garden. As well as tough outer walls, the interior also benefits from very thick framing. 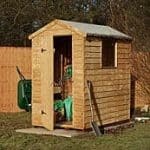 So if you’re looking for a budget shed that is built to last, this is a good option. An openable glass window adds not just a stylish element to the building, but it’s extremely practical too. Natural light floods into the shed, whilst in the hotter months you can open the window to provide ventilation. It also comes with an added benefit of being placed on either side of the shed. Access to the shed is gained via ultra-wide double doors which stretch out almost the entire width of the building. This makes storing practically anything a piece of cake. The timber has been given a basecoat treatment, but will require additional treatment after installation. It comes with a beautiful Golden Brown colouration to give it a slight edge over its competitors. 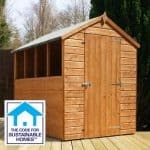 All in all this shed really does offer outstanding value and it comes at a brilliant price. The only thing that slightly lets it down is the solid sheet floor. However, it is adequate enough to hold light and mid-weight storage. Solid Sheet interior lets the quality down a little. 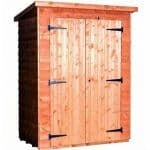 It restricts what you can store in the shed, though it’s ideal for those with lightweight storage needs. 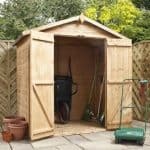 The Shire Shiplap DD wooden storage shed is perfect for light and medium weight storage. It comes with pretty unusual measurements compared to similar buildings. The door measurements are most notable, with the width being a lot wider than the doors found on most sheds. The height of the doors however is a little shorter than average. So if you’re fairly tall, you will need to duck in order to enter the shed. 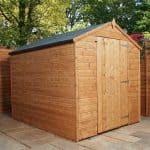 What’s interesting about the floor and roof of this shed is that although they are both made from solid sheet materials, they do measure slightly thicker than average. For example, on most sheds the roof is made from 8mm materials, whilst the floor is created with 10mm materials. Both the roof and the floor of this shed measure 11mm thick. So in comparison to most of its competitors, it is slightly more robust. The gentle sloping apex roof is covered by a free felt supplied with the building. It offers excellent water resistance, though the felt could possibly do with being upgraded as it isn’t the best quality. High quality Shiplap tongue and groove is used to create this very robust looking shed. Featuring an incredible water-drainage channel, Shiplap panels provide the most durability and are mainly found on high-end sheds. Therefore it’s pretty surprising seeing it used on such a budget model. Tongue and groove ensures the building is easy to assemble and it gives a strong, interlocking design. There is also a little space left between the panels in case the timber warps throughout the year. One of the more unique features of this shed is its extra-thick, robust frame. It measures 34mm x 34mm which is a lot thicker than standard. This basically ensures that the shed has maximum support. Before being shipped, the timber is basecoat treated. This is a very light treatment which protects it throughout transit. You will need to treat the shed once you’ve erected it, as well as annually. You are given extraordinary access into this shed thanks to two very wide doors. The double door feature makes it simple to store practically anything you like, though as mentioned the strength of the floor will prevent you from storing heavy equipment. There are a couple of things that set this shed apart from competitor models. One is the fact the shed is supplied with a glass window, rather than styrene. This window can also be opened which is another unique advantage. Then there’s the hasp and staple that is supplied on the double doors. Typically with budget sheds you find they tend to feature a butterfly catch. The hasp and staple is a more efficient closing mechanism that will help to keep the doors closed when they need to be. Despite its tough looking design, this shed is actually vulnerable to theft. This is because whilst the hasp and staple is a great feature on such a low cost shed, it doesn’t lock the building. Instead you need to buy a padlock. There are some really good, inexpensive ones on the market however so financially it shouldn’t be too much of an inconvenience. We do feel the lack of security is justifiable due to the great value for money provided. One good thing about security however is the opening window isn’t going to be easy to get through. It comes with a traditional lock on the inside. The only bad thing about the window is it does allow people to peek inside. It is possible to resolve this by installing some form of window covering such as a blind. This will give you your privacy and also make the building cooler in the summer months. The one customisation option you can make with this shed is the placement of the window. It can be moved to the left or right hand side of the shed. If placed on the right of the shed, it will be situated more towards the front. If placed on the left hand side however it will be placed more towards the rear. Surprisingly Shed Store don’t provide any extras with this shed. There are some recommended products which you might find useful including a plastic wheelbarrow, a tool rack, an outdoor water station and a storage shelving unit. The storage unit and tool rack can add more storage space, but none of these are essential. Though there aren’t any extras to add to your purchase, we would recommend finding a good quality padlock. A hasp and staple on the double doors won’t keep them locked, but it does supply room for a padlock to be fitted. The exterior of this building benefits from high quality Shiplap cladding, but inside is a different story. The solid sheet materials do sacrifice its quality a little, as does the low quality roofing felt supplied. However, for the price you pay you are getting a high quality building compared to many competitor sheds out there. With regular maintenance, this shed will last a very long time. However, you do need to be wary of the quality of the felt and solid sheet floor. If you choose to store anything heavy, it could damage the floor and lower its longevity. There isn’t that much floor space, but the walls will support shelving installation and you could also hang heavy tools from hooks on the wall too. So this does improve the amount of storage offered. It is largely suitable for basic gardening equipment. 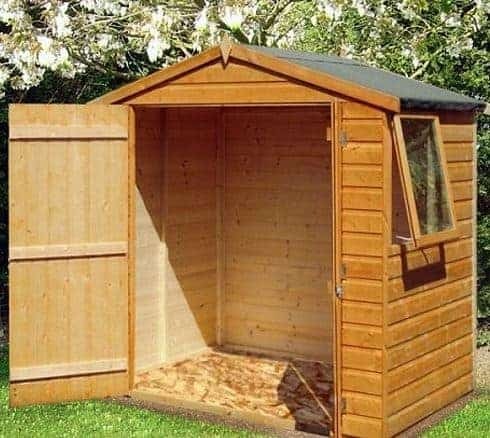 Whilst the shed is mainly easy to assemble, it has been noted by customers that the instructions are a little vague. So it may take a little longer to erect if you’re not very skilled at DIY. It’s estimated the assembly will take around 4 hours to complete. Being a budget shed, this does offer great value for money. Wes especially like that you get a glass opening window, as well as extremely good quality Shiplap clad walls. Final Thoughts: You can’t help but be impressed by the quality of this budget Shiplap storage shed. Though the tongue and groove build doesn’t feature all the way through the building, it still provides a very robust design. The double doors are an outstanding feature and offer a huge amount of space to transport your tools and equipment in and out of the building. A sleek Golden Brown colour gives the shed a chic, beautiful design. 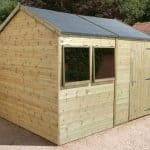 Overall if you’re searching for a shed that offers style, practicality and affordability then this is definitely one to consider. The openable glass window is another nice touch and we like it can be installed on the left or the right side of the shed.